Tile Installation Expansion Joints Are Critical for Success! Expansion joints are also known as Movement Joints or Movement Accommodation Joints. In ceramic, porcelain, glass and stone tile installations, they are critical to the success and longevity of the installation. “A joint through the tile, mortar, and reinforcing wire down to the substrate.” By integrating these “stress relievers” into the tile assembly, expansion and contraction takes place without compromising its integrity." Sadly, they are probably the least used, most misunderstood and yet one of the most important listings in the Tile Council of North America (TCNA) Handbook. The reason they are so critical is that without them, especially on floors subject to sunlight, most installations which otherwise appear to be well done, will fail. Without enough room for the tile assembly to expand, the tile will pop up or “tent” most times in the middle of the floor. This situation can occur in both commercial as well as residential jobs, so none of them are exempt from this requirement. If you are not certain what I mean by tenting tile, here is an unfortunate example. The really sad part of this situation is that the installer did an excellent job… except for the lack of any expansion joints. "One of the most basic and important facts an installer should know when working with ceramic (including porcelain, glass, and natural stone) tile is to always have expansion joints in place. If expansion joints are not part of the installation, failure is lurking in the shadows waiting to strike. On this project, 5,000 sq. ft. of tile was installed on the floor of a public building. An unqualified installer who was a sub to a sub to a sub put the tile in, and he did not install any expansion joints within the body of the tile or around the perimeter. In two places the tile was tented to the point where I could put my hands one on top of the other underneath the tented tiles." Given this sentence, where does the misunderstanding begin? 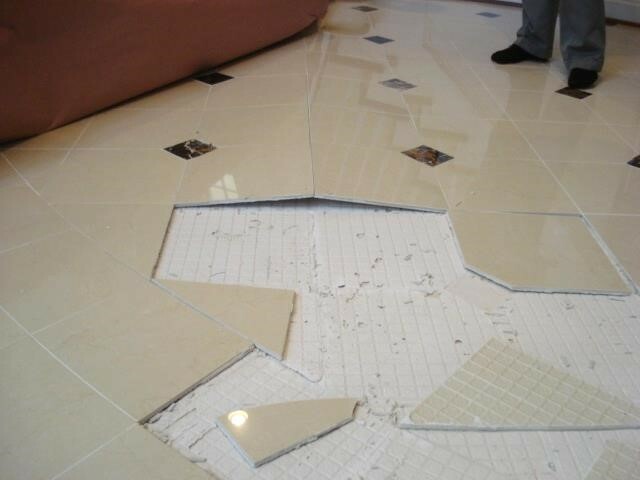 Unfortunately, many people involved in the installation of tile products don’t understand that the tile does move. If this expected movement is not accommodated, the tile will become rebellious and most likely will become very expensive for the responsible person or company. In other words, as a tile installer you are much better off to simply include expansion joints on every project. Again however, it is not the installer’s responsibility to design and locate these joints. That is to be done by the design professional or engineer. I call your attention to the sealant. Notice that the elastomeric sealant is attached only on the sides of the two adjacent tiles. One critical point here is that the sealant does not contact or bond to the sides and/or bottom of the joint. If the sealant is allowed to do so, it is locked in place and will have zero movement ability. In this case, the insertion of a “Rounded Back-Up,” or foam backer rod allows the concrete floor to expand and contract, but its primary role is to keep the sealant where it belongs: attached to the tile only. Think of the movement of the sealant as an in and out movement like the action of an accordion. The sealant will also allow the tiles to move in a back and forth motion similar to rubbing two hands together. Lastly, you will notice that the detail refers to the joint material as sealant. This is done purposely to differentiate it from lesser quality caulking products (acrylic latex or siliconized latex) which dry hard and do not allow for permanent flexibility. According to the requirements of EJ171, this sealant must be 100% silicone, urethane or polysulfide. If you understand these principles and install the joint properly, you can expect that the expansion joints will permit this required movement to take place, keeping the tile flat on the floor where it belongs. Certified Tile Installers understand this and can properly install movement accommodation joints. >> Visit The Tile Installation Experience with Scott Carothers at Coverings. Here are several comments we’ve received since publishing this article in 2016. "Although I agree with you on the need for expansion joints, I have to disagree on the fact that you thought the installation was otherwise perfect. As anyone can see from the picture, there’s no sign of bonding between thin set and tile, notice that piece of tile, it has no thin set stuck to it whatsoever. That tells me that, although the installation looked good, it wasn’t executed the right way, no back buttering anywhere. A big NO NO." Sergio, you are correct and my choice of words in the August 2016 article should have been different. This installation did have additional issues that are evident. Notice that the mortar coverage is nearly 100% (minimum coverage in dry area must be 80%), but as you indicated, there is no transfer of the thin set mortar to the back of the tile. Unfortunately, the installer on this job was in error due to the fact that the jobsite conditions -- including high temperatures and wind blowing across the floor during the installation -- were not handled properly. Had these two environmental conditions been accommodated along with dampening the substrate and not allowing the mortar to skin over, the proper bond would have been achieved. You are also correct that back buttering the tile will increase the bond of the mortar to the back of the tile, but according to the ANSI Specifications (see below), back buttering is not a requirement. Additionally as seen below, the installer should have periodically removed a tile to ensure that he was getting an adequate bond. Expansion Joints Are Necessary. That's Not Overly Dramatic! Getting professional installers does not guarantee that they will properly install movement/expansion joints. They claim that I am being overly dramatic and that they do not think it is necessary. They will do what I want, but they think that it is not needed! Wow! John, it sounds as if you and I are on the same page about the need for expansion joints. 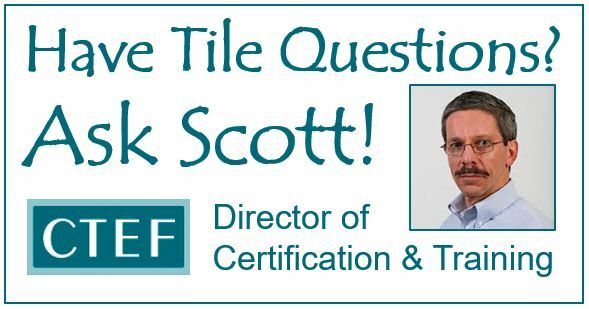 I can’t speak to what you have termed “professional installers”, but I was talking specifically about CTEF Certified Tile Installers (CTIs). In preparation for taking the CTI tests, installers study the necessity for and the requirements of expansion joints and must demonstrate their ability to properly execute them as part of the hands-on test. It is unfortunate that your experience in obtaining something which is a requirement of the tile industry has been difficult. I have seen this mindset many times in the field and likewise have been told that I am too fussy. It has nothing to do with me, it is a tile industry standard. 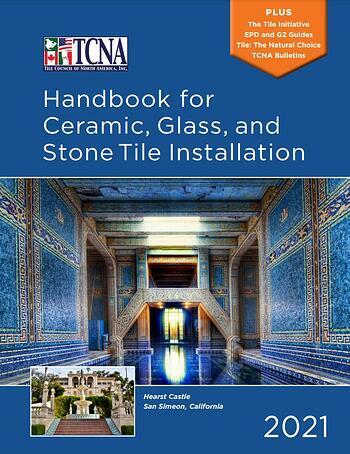 I always encourage installers to follow the Tile Council of North America (TCNA) Handbook and American National Standards Institute (ANSI) Specifications. Many times I get calls and emails when one of the “we don’t need them (expansion joints)” tile placer (not a qualified and certified tile installer) gets into trouble with a failure. They throw their hands up into the air and ask, “Why did this happen to me? I’ve been doing tile for over twenty years and never had a problem.” Until now! I'm an avid do it yourselfer with over 40 years of construction experience. I'm getting ready to tile two bathrooms in the home I'm building. I've used the Schluter System - Ditra and Kerdi-band membranes for waterproofing the entire floors and shower stalls in these two small rooms. I'm concerned regarding perimeter expansion joints. I was planning to simply use cove base tiles along the walls and in the shower. Schluter offers an expansion strip specifically for this use. But it doesn’t work with cove base tiles. Should I give up on the cove base idea? And are perimeter isolation joints necessary even in small 30" x 60" tiled shower stall? Thanks! Gary, ceramic cove base will work nicely as long as you place a joint of 100% silicone or urethane sealant in the space between the floor tile and the lip of the cove base. This space should be 1/4”, but never less than 1/8”. The use of the cove base or the manufacturer’s pre-made movement joint is strictly your call. Both work well when properly installed. The ANSI Specifications call for a movement accommodation joint when there is a change in plane as in your floor to the wall. Unfortunately, these joints are not always completed during the tile installation which can lead to maintenance and call back issues in the future. I read an article where it says that you can have a Perimeter Movement by just leaving a Gap between the Tile and wall, and not to fill it! My question is if I have an exterior tiled Deck and the tiles that end on three sides of the deck are free to expand or contract, with no wall or hard surface restricting the movement!, can these three sides of the tiled deck be considered Perimeter Movement?!!! John, since the three sides of the deck are not restricted by any walls or columns, movement accommodation joints would not be required. However, sealant would be needed on the fourth wall in the joint between the house wall and the edge of the last tile. As to your first statement about an open space between the tile and the wall, this would be true only if the installation is interior. If it were an exterior installation, the space would need to be filled with an elastomeric sealant such as 100% silicone or urethane. hey Scott, i have a few questions : -whats the minimum width for the joint ,the gap between the tile where we have joint will be? - every how many meters we should install it (interior/exterior) thanks&regards. Ahmad, we will consider your question in two ways, exterior and interior as per the Tile Council of North America (TCNA) Handbook. For exterior movement joints, the minimum width is 3/8” (9.53 mm) for joints 8’ (2.44 M) on center and minimum 1/2” (12.7 mm) for joints 12’ (3.66 M) on center. The minimum widths must be increased 1/16” (1.59 mm) for each 15°F tile surface temperature change greater than 100°F between the summer high and winter low. 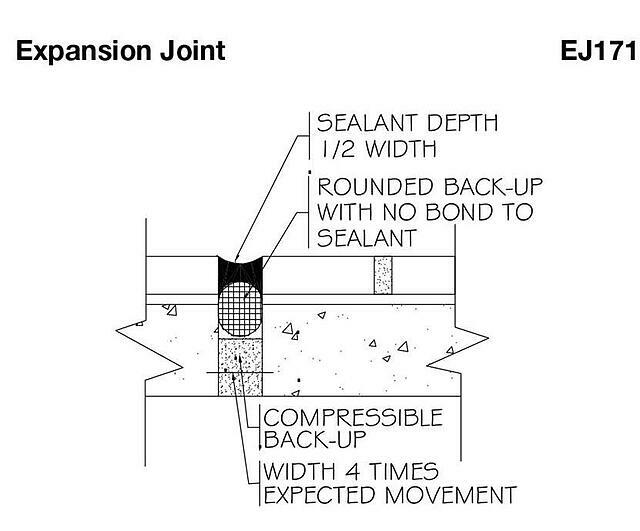 For interior perimeter movement joints at perimeter walls-not less than 1/4” (6.35 mm) which is commonly covered by tile trim, cove base, or shoe molding. Perimeter joints, other than perimeter walls-preferred not less than 1/4” (6.35 mm), but never less than 1/8” (3.18 mm). For tiles subject to direct sunlight or moisture: quarry tile – same as grout joint, but not less than 1/4” (6.35 mm); all other tile – preferred 1/4” (6.35 mm), but not less than 1/8” (3.18 mm). For change of plane (floor to wall or wall to wall) – same as grout joint, but never less than 1/8” (3.18 mm). Still Wondering Why You Need Movement Joints? If I've not made the point about how critical expansion or movement joints are to ceramic tile installation, please let me know in the comment box below. If you're still wondering, consider learning more about the Certified Tile Installer program. Note: This article was originally published on August 2, 2016 and has been updated.